As I have said on previous occasions, the homes of today are increasingly small. This phenomenon is explained by different factors, such as economic crisis, the change in family structure or lack of space to build in the cities. To address the shortage of square numbers in the different rooms of the home must use different tricks, for example, the use of multifunctional furniture pieces. However, to the different living spaces seem larger than they really are is essential to decorate them with appropriate colors. To lend a hand when it comes to put your small house, today we speak of the best shades to decorate one of the most important rooms in any house: the kitchen. Would you like to join us? How could it be otherwise, we have to start talking about the white, a color that is always recommended when decorating small rooms, as it is able to expand the space visually and enhances the brightness, which is also essential for any space look larger? However, the target has many more advantages. 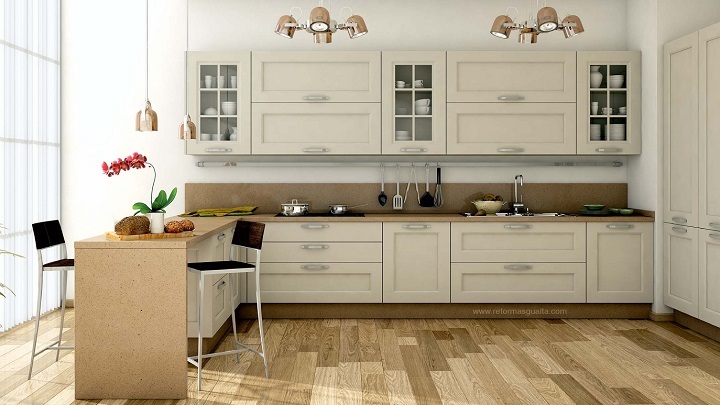 For example, it is important to note that this color has always been widely used in kitchens remarkably attractive. 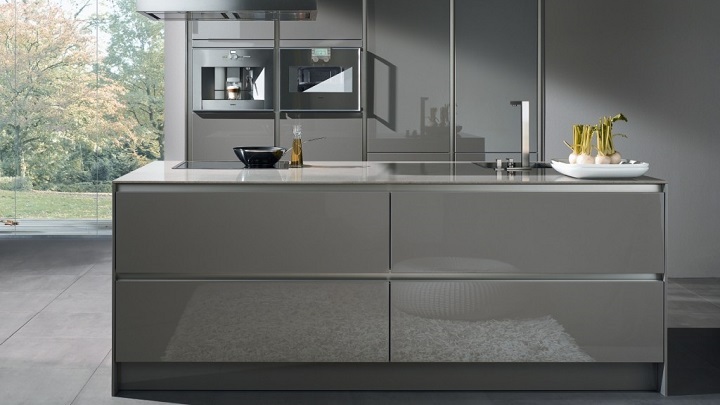 In addition, it can fit perfectly in kitchens of all styles: vintage, modern, minimalist, classic, Nordic … Nor should we forget that white conveys the feeling of cleanliness and purity. Of course, you can use white in all the elements that are part of the room (furniture, walls, appliances, textiles …), but you should not forget to add a touch in a bright color so that the space is not boring or too cold. The good thing is you can choose any color, as white blends perfectly with any shade of the color palette. If the choice of white do not just convinced, another good idea is to opt for beige. The best thing is that this tone is much warmer and cozier than white, but still as bright as this. Of course, it also extends the space visually. On the other hand, keep in mind that, well used, can help us create spaces really elegant. Another major advantage is that the beige, like white, can be combined with many shades. Mixing with other neutral colors such as, brown, can be extremely attractive. In addition, you can also look great with yellow, red, pink, green, blue and orange, among many others. Did you know that gray is one of the colors of the moment? Yes! Yes! As you are reading! 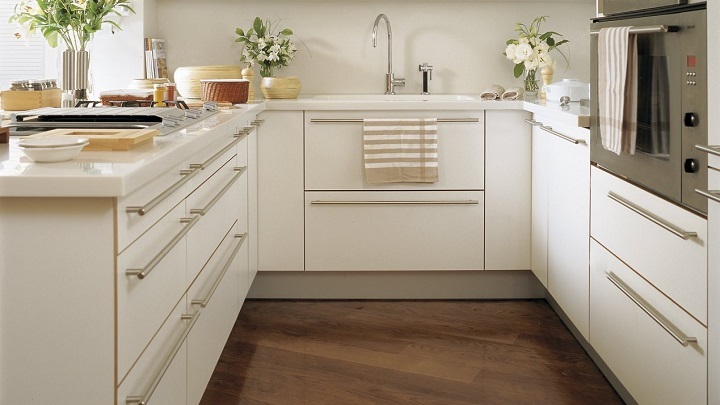 Considered a neutral tone is perfect for all travelers, including kitchens. However, in the case of small rooms, it is always better to opt for lighter shades of this color, which is one of the most elegant of the entire color palette. It also transmits calmness and serenity, two useful qualities in the kitchen, where sometimes we can put a little nervous. Like white and beige, gray it is the most versatile, as it can be combined with many other colors and fits perfectly in both modern and traditional rooms. On the other hand, keep in mind that being a neutral color; it is ideal to accentuate both cold and warm colors. Of course, if your kitchen is small it is better than the light gray combined with white, but can add more cheerful and bold brushstrokes.